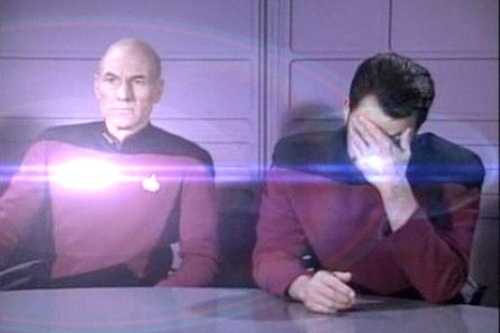 Treknobabble: Lens Flare App for your iPhone allows you to ruin any Trek screenshot you like! I was watching an episode of Human Target last night that seemed to utilize liberal usage of lens flare. I immediately thought of this posting and wondered if J.J. Abrams has anything to do with Human Target. I think I should point out that whoever lens flared this shot missed a golden opportunity to have the flare coming off of Picard's head. The iPhone has prescient content info, spell check abilities and even a word reference for a snappy interview.